Thank goodness for the Wicked Wednesday Challenge, at least I got to spend just a few minutes in my studio without interruption. 2 1/2 X 3 1/2 inches just takes a few minutes to create once you've got your idea. Still time to enter in on the fun. The team had created a big variety of projects so I know you'll get lots of inspiration. Omg, you have your hands full taking care of everyone! So glad you were able to find a few minutes to create this wonderful little atc...which is perfect for this week's Wicked Wednesday challenge. You've had your hands full! Love this ATC. Cute mummy! Thanks for joining us at Wicked Wednesday. 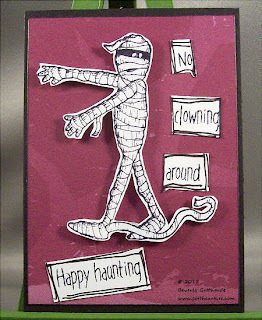 LOL I just love the mummy image on this ATC Bev!!! Thanks for joining us at Wicked Wednesday this week!